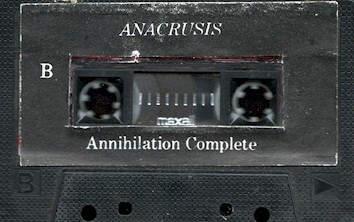 Highly rated ANACRUSIS, a technically minded Thrash unit with a Progressive edge, date from 1984 and are based in St. Louis, Missouri. 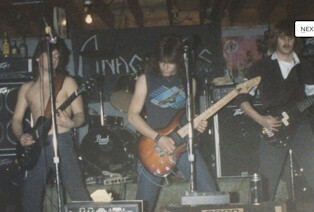 Frontman Ken Nardi had previously operated with HEAVEN'S FLAME. 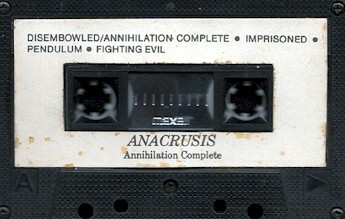 ANACRUSIS debuted with the 1987 'Annihilation Complete' demo. The band featured a track on the UK 'Metal Forces' magazine compilation 'Demolition' in 1988. The band would record the inaugural 'Suffering Hour' album self financing it to the tune of $1200. The European Axis label, headed by 'Metal Forces' magazine editor Bernard Doe, would be quick to snap the band up. The only official demo! Two versions were made. First version. This version was recorded in late 1986. Different track listing and artwork. Covers were basic layouts with lyrics which we had printed at a local printer on thick cardstock. The only official demo! Two versions were made. Second version. Different track listing and artwork. This version is what got them signed and voted best demo of the year. Covers were basic layouts with lyrics which we had printed at a local printer on thick cardstock.